Alfred Sisley. 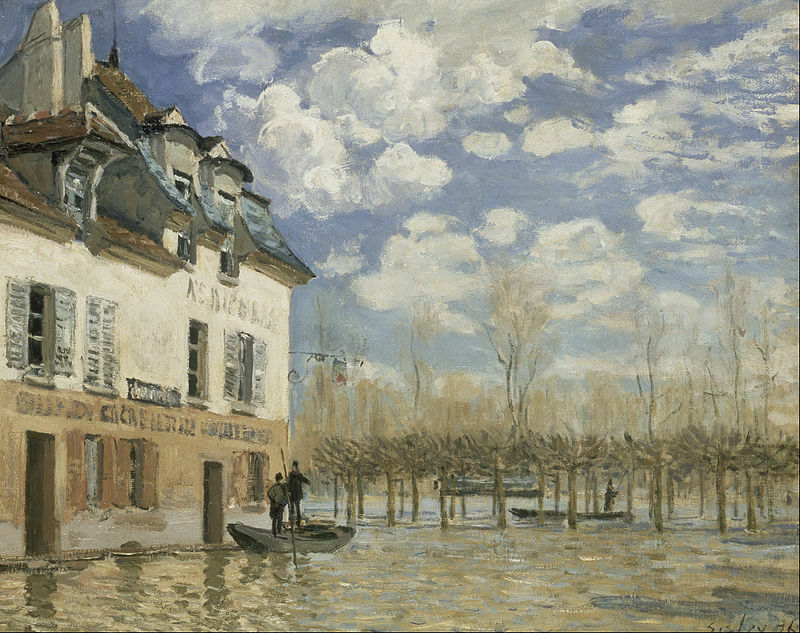 Flood at Port-Marley, 1876. Wikimedia. Hello everyone. This is Jen filling in for HA while he takes care of some pressing educational matters. Please forgive me as this post is slightly different from the norm – and I know today we’re missing HA’s thoughtful posts! — What images in the video piqued your interest – tickled your muses? — What does “the river has overflown its banks” mean to you? — What does “quiet life” mean to you? In keeping with the experimental nature of this video, if you can, try to respond by means of a single tanka or haiku. A snapshot. The video doesn’t explain everything – you don’t have to, either. It’s okay to leave your readers with questions to sort out for themselves. 1. Publish a post with your haiku or tanka if you have a blog. If you haven’t got a blog, you can share them in the comments down below. In case you have published a post, you can submit its link in the linking widget. 2. After you have made the post, take some of your time and visit the links of other participants. This is how we learn and improvise. Return again at the end of the week if you have made your post during the weekdays because there would be new links to visit, which would help us all to make connections and develop the feeling of community and togetherness in our adventure every week. Even if you can’t take out the time to visit all the links, then visit at least the link shared before or after you and offer your feedback and develop comradeship with that person. Please add the following tags to your post: HeedingHaikuWithHA and MindLoveMisery’sMenagerie. Pingback: beloved snapshots (senryu / photo edit) | Blog It or Lose It! This entry was posted on February 18, 2015 by Paloma in Haiku, Tanka and tagged A Quiet Life, Alfred Sisley, Flood at Port-Marly, Heeding Haiku with HA, HeedingHaikuWithHA, Teho Teardo & Blixa Bargeld.